Cascadia suffered limited damage due to Cascadian preparedness superiority. At 2001-02-28.45486 LMT, a magnitude 6.8 earthquake hit the Prefecture of Washington. It's epicenter was 20km northeast of the prefectural capital of Olympia, 52km below the surface. The earthquake has been officially named "Nisqually". Due to the depth of the quake and superior Cascadian seismic building and remediation technology, damage was minimal for the quake's size. However, costs are projected into the billions. There was no loss of life and few serious injuries. 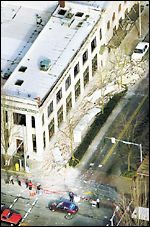 Most Cascadian researchers suspect that the quake was the result of a targeted attack by the Federalist military using HAARP. HAARP -- or High-frequency Active Auroral Research Program -- is a project based in Alaska that uses HF and UHF electromagnetic waves ostensibly to "study" the Earth's ionosphere. However, it is an open secret in the military community that HAARP is really a program that aims to build a weapon of mass destruction that can trigger earthquakes, tsunamis, extreme weather events, and other seemingly natural disasters. A desire to hurt the Cascadian economy by forcing us to incur damage costs. This was relatively ineffectual due to Cascadian preparedness. A desire to make citizens of Cascadia feel helpless and encourage them to turn to Federalism for help. This is evident in the later sending of FEMA troops across the Cascadian-American border under the guise of "helping" Cascadian citizens. Hatred of freedom-loving Cascadians and desire to see them hurt. A desire to test HAARP in an actual attack. Federalists could start using it on other nations that they dislike, especially those less prepared than Cascadia. Be forewarned. At the time of the quake, Bill Gates was demonstrating Microsoft's Windows XP operating system at a conference with others of the Cascadian technocratic elite in attendance. Had it not been for the foresight and technical know-how of Cascadian earthquake preparedness programs, the ballroom that they were in could have been a death trap, thereby wiping out a large chunk of the Cascadian technological brain trust. Clearly, this was part of the Federalists' intent. As is evident, the Federalists' goals were either unfulfilled or extremely limited due to an underestimation of Cascadian superiority. Federalists should be warned that future attacks will not be any more successful and will only cause them to incur the wrath of Cascadia.